Or at least, this is how I got mine back. All summer long, I’d been wanting to spin but never seemed to manage it. My summer travels disrupted any sense of momentum, but that seemed more an excuse to me than a real reason not to get any spinning done. I just couldn’t seem to make myself do it – and it’s always a shame to feel like you have to “make” yourself do something you love. By the time I finally sat down to the wheel in late August, I think I had not spun anything since April I think. So here’s how I got back to the wheel. 1. Do the hard thing. Ask yourself: What is really standing in the way of my creating? What is blocking me, scaring me, or paralyzing me? What hard thing am I avoiding? Usually when my mojo fizzles out, it’s because something is daunting me. Something feels hard or overwhelming, and it’s standing in the way of moving forward. When I consider crafting or creating, I can get paralyzed because of this hard thing, whatever it is. I’ve realized that if I can just make myself deal with the hard thing, I can get unblocked and start moving forward again. In the case of my spinning, I was being held up by the fact that the yarn I had on the wheel was one that I’d lost my enthusiasm for spinning – it’s a yarn that I want to finish making eventually, like maybe next spring, but I’m not feeling any desire or need to get it done now. But there it sat, on my wheel in April, and in May, and in June, July, and August. I knew that I needed to either spin it or get it off the wheel. If I had lots of extra bobbins around, I suppose it wouldn’t have been an issue at all. But I have precisely four bobbins, and they all actually have something on them. Yes, apparently I have played this game before – running out of steam before I finish up a bobbin. I realized that what I really needed to do if I wanted to get back to spinning was to clear that dang bobbin, one way or another. So I did. It was so tedious, y’all. This may look small, but it took forever. It was very slow going, as this was thin, slippery yarn (four ounces worth). But I wound it by hand and got every inch off the bobbin and on to the toilet paper roll. It was a sweet relief to finally see a clear bobbin after five months. With a clean slate, I could finally move forward to the next step. 2. Do the easy thing. Ask yourself: What would be the most fun thing I could do right now? After facing the thing that was holding me up, it was time for a little cake. Not actual cake, just the reward of spinning something really fun. 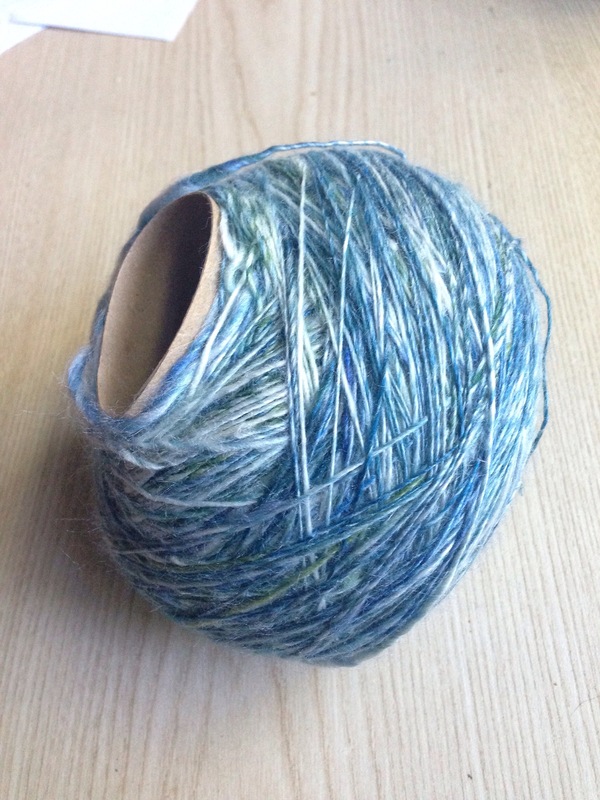 My go-to yarn for when I want to make something quick and easy is a nice, fat, thick-n-thin singles yarn. This is the July 2014 fiber from the Hello Yarn Fiber Club, “Head Banger” on BFL, 194 yards bulky thick-n-thin, lightly fulled. Good grief, I love spinning fat singles. And there’s nothing like doing the fun, easy thing, after having done the hard thing, to really get the creative momentum going. Whenever I need a boost to my spinning, this is my default yarn. 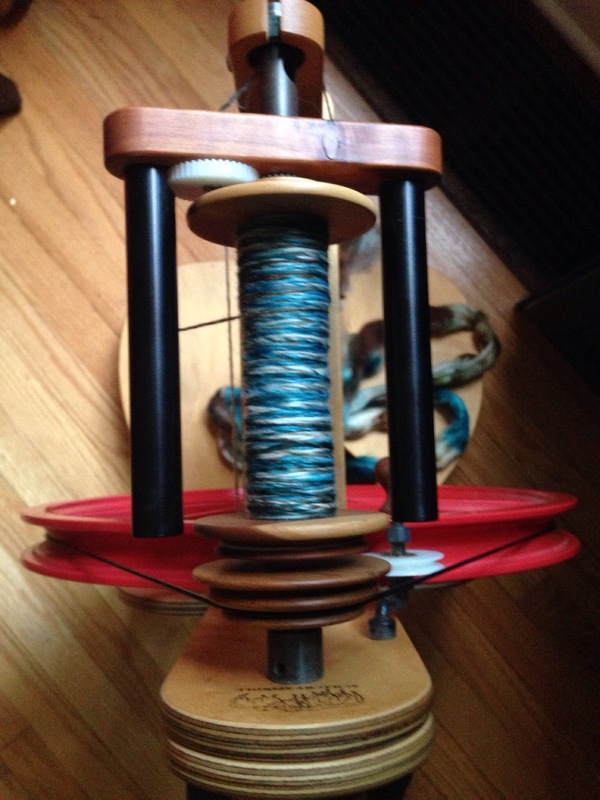 I just find it such a delightful thing to make – it always makes me realize again why I love spinning. After I finished up something fast and fun, it was time to do one more thing to help me keep moving forward. 3. Do the basic thing. Ask yourself: How can I lock in this momentum on a basic level? What could I do to keep things from getting too hard again? What basic practice, tool, resource, or technique do I need to revisit in order to recapture my proficiency? This was the final piece for me, for getting my mojo back. I realized that part of what was keeping me a bit stuck was my wheel. Last year, I got a new wheel, and I’m totally in love with it, but even after a year of spinning on it, there are some ways I still haven’t adjusted to it. In fact, I think I might need to take it apart and put it back together, as I’ve had a couple of issues with treadling, and I want to get a better sense of the wheel and of my relationship to it. But for now, I’ve decided to get back to basics. So I pulled out my first wheel, my sweet Ladybug. I haven’t spun on her at all in over a year, ever since I got the Matchless, and it was high time to show her some love. 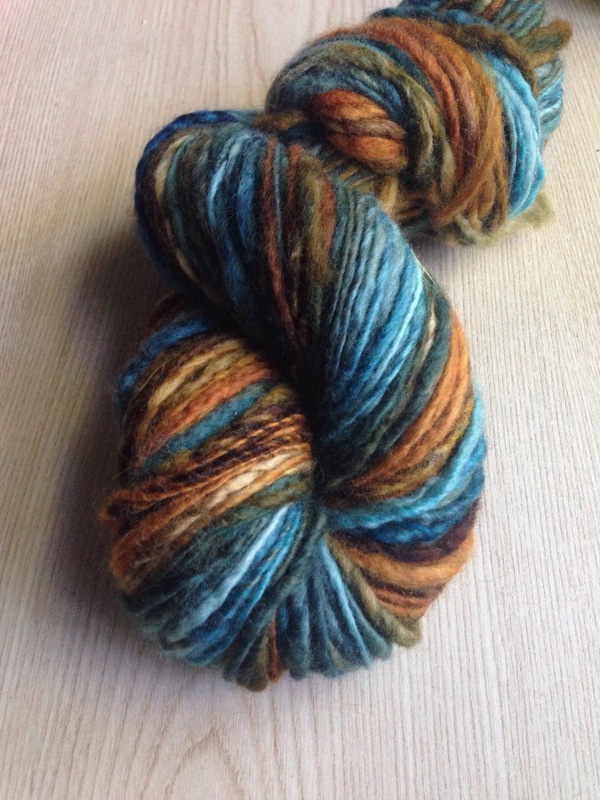 I’ve been rewarded with some of the most delightful spinning I’ve done in awhile. It’s surprising what a difference there is between the two wheels, and even more surprising that it’s the Ladybug (an entry-level wheel) that is giving me a thrill these days. I probably will get even further back to basics and take a break from the Woolee Winder, just to see what effect that has on my spinning. I already know that will be a harder shift, as I am so in love with it. But it will be good to really go all the way back to the beginning, and actually move yarn from hook to hook as part of my spinning process. I think this will help me get more adjusted to my Matchless as well. At any rate, spinning on my sweet, basic wheel is really giving me the confidence I need to get back in a good rhythm of daily spinning. The yarn I showed you last week was spun on the Ladybug, and the yarn I’m halfway done with now (pictured above) is also on that wheel. It’s been really nice to get back to my spinning roots, so to speak, and get in touch again with my beginner enthusiasm, but from a more proficient level. And so, I have found myself back in a great groove of regular spinning, which is just such a wonderful, meditative way of starting my day. Not to mention the delight of producing handmade yarn. How about you? What do you do to recapture your mojo, your momentum, or your enthusiasm for your crafty or creative pursuits? I’d love to hear your tips and stories. I’m also going to apply these three steps to another craft I’ve been struggling with. Hint: it’s not knitting. Stay tuned…. When my mom passed away in Feb. 2012, I lost all enthusiasm for spinning and I was going to sell my wheel. My husband suggested I just leave it in a corner and give myself time. In May 2013, at the request of a friend, I decided to attend a ‘spin-in’ at a vineyard near me, and I’m so glad I took my wheel with me. It gave me the inspiration back that I had lost, and now, I love spinning again!! So I would advise anyone to attend an event for whatever craft it is they’ve lost their mojo for…you just never know!